The slitinto Dual Mini Wi-Fi Smart Plug uses your existing home Wi-Fi network to provide wireless control of your lights and appliances. 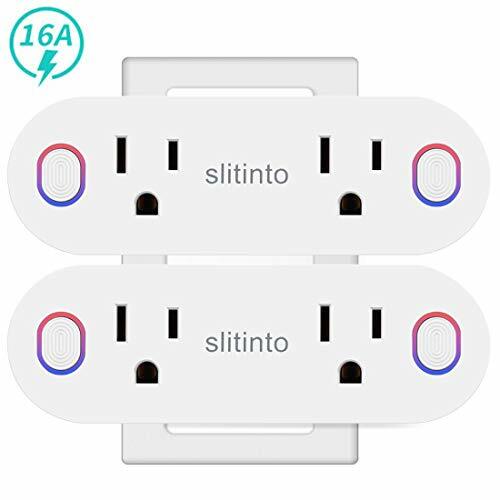 No subscription or hub is required: simply plug slitinto Dual Mini into an electrical outlet, connect a device to the Smart Plug, and wirelessly control your device using a tablet or phone. Using the free Smart Life app, you can turn your devices on and off and set worry-free schedules from anywhere in the world, so that they run on your schedule. You'll find that automating your devices will help streamline your daily routine for a more efficient household. Within the Alexa and "Smart Plug" APP, give each of the two outlets seperate names. For example, label the whole thing "living room" and Alexa will turn them both on/off. Name one "light one" an the other "light two" (or whatever name you want) and you can request Alexa to control a specific outlet.